Vedi le Scelte “Code of Conduct for Nanotechnologies.” è stato aggiunto al tuo carrello. This paper makes an original contribution to the responsible research and innovation (RRI) discourse, with an inquiry into the extent to which risk, risk assessment, or risk management, including ethical and social issues, is relevant to companies. 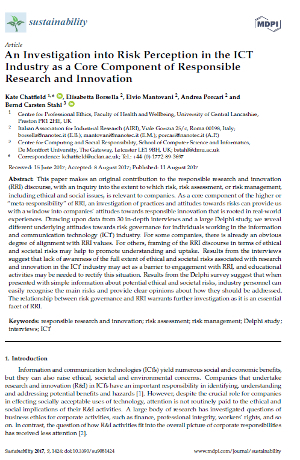 As a core component of the higher or “meta-responsibility” of RRI, an investigation of practices and attitudes towards risks can provide us with a window into companies’ attitudes towards responsible innovation that is rooted in real-world experiences. Drawing upon data from 30 in-depth interviews and a large Delphi study, we reveal different underlying attitudes towards risk governance for individuals working in the information and communication technology (ICT) industry. Published in Sustainability 2017, 9, 1424. Report sulla valutazione etica della R&S. Industria, nanotecnologie, standard.